Hey there, everyone!! Welcome to my third post as a guest designer for Flourishes Timeless Tuesday challenge this month! I have been having so much fun creating for these challenges, and am so happy that Amanda asked me to join in on the fun this month! This week's challenge is a color challenge, and we were asked to create a card using poppy red, emerald green & espresso brown. I've been so immersed in using all the new Glitz & Prima goodies for CHA...that I decided to dig in my stash for this card and use up some older goodies. I also used one of my favorite Flourishes sentiment sets called "Tag Lines"...if you don't have this set it is definitely a must have! I couldn't completely stay away from the new stuff though, so I stamped the sentiment on some of the new woodgrain patterned paper by Glitz. LOVE it! Here is what I created! 1. Make A2 card from green cardstock. 2. Cut red chevron paper slightly smaller and adhere. 3. Cut a strip of book paper and layer across the top. 4. Layer two brown stickers together with foam adhesive, then adhere to the left side of the card. 5. Add a printed rhinestone to the top of the tag accent. 6. Adhere flowers to the upper right and bottom left of the card. 7. Stamp the sentiment to a banner edged paper strip, then adhere above the flowers. 8. Accent the sentiment banner with a rhinestone bow, then add a strip of red jewels to the top to finish. The supply list is as complete as I could make it...the stores available for linking from didn't have everything listed on my card. If you are wondering about anything not shown, leave me a note in the comments and I will let you know! Be sure to check out what the Timeless Tuesday team has created for the challenge as well! I hope you've enjoyed my stash filled love card today! Thanks for stopping by! Lovely! Love the charms and papers! Love Love LOOOOVE that flower with the hardware. How cool!! This is absolutely gorgeous. The details are stunning and the layout is so eye catching. Thank you for joining us at Inky Impressions. Be sure to check out our Love Spell blog hop for more chances to win. Oh Lea... this is gorgeous! 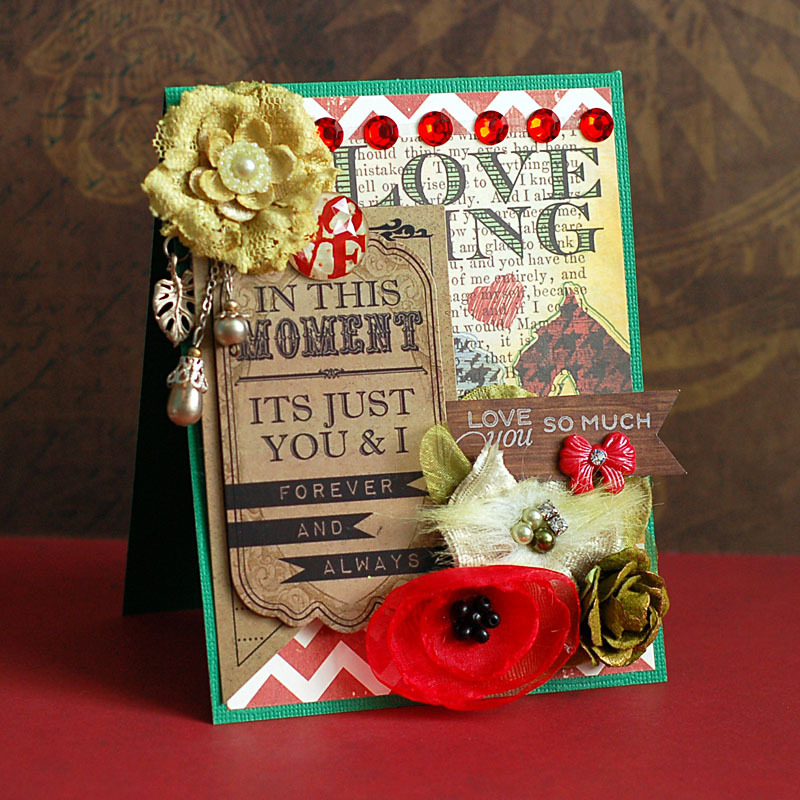 I so admire how you put so many beautiful embellishments and beautiful papers together! I just love this week's card! Happy New Year - and happy (belated) birthday, Miss Lea. I see you're making more pretties. Breathtaking stuff, for sure. I love seeing the primary colored stuff - so refreshing. I don't do Instagram, but I love seeing those pictures you shared - look at the way you dress...no surprise you're so stylin'. What a fabulous card, Lea! LOVE all those gorgeous flowers and how you featured the sentiment! Wonderful mix of embellishments Lea. :-) Thanks so much for joining our "Love is in the air" challenge at TSG! This is stunning Lea!! I love how you added the FLLC sentiment and gorgeous flowers!